Greetings from Des Moines, Iowa! I will answer my own question. We are waiting for several things. We are waiting to go home, waiting for Krishna's staples to come out, waiting for her peritoneal dialysis catheter to come out, and most importantly, we are waiting for her new kidney to function at full capacity. We are not at all unhappy with the progress thus far. We are so happy we can't stand ourselves! The new kidney is much like a marathon runner, a little slow out of the gate, but comes on strong for the long journey ahead. I am happy to report that although the kidney was a little sleepy after the transplant, it is now functioning at almost full capacity. The doctor believes Krishna will have normal function by end of the month. Krishna will go home without any hardware. The staples will be out, the catheter will be gone. Was it worth four weeks in a hotel? YES!!!!!!! I only mention the "Sleepy Kidney" because it is important for people to know that this can happen due to the initial trauma the kidney experiences during the transplant process. Some kidneys take right off, and others, are a little sleepy. This can cause concern, but it is vital to know that a very high percentage of kidneys wake up within a few weeks and everything falls into place. I will now share with you what we did not have to wait for. The calls, texts, prayers, cards, and donations started pouring in before the transplant was finished. The last post described the "Miracle Flight", this post could have easily been titled "Ask and You Shall Receive!" Words cannot describe the outpouring of support we have received. We are still receiving cards and donations! We are so humbled and grateful! The title was chosen to get folks thinking about their own transplant journey. What are you waiting for? It is my hope that Krishna's story will get your wheels turning. Who do you know that can benefit from this information? I promised to tell you the good, bad, and the ugly. I am not going to stop now that Krishna received her transplant. Staying away from home for a month is not fun. we are going crazy in this hotel. It is expensive to stay in a hotel, and food expenses are really mounting up. We do have a microwave and a small refrigerator, so we are trying to buy food we can make in the hotel. There is no abundance of good options when you are using a microwave. We also need to get out for our sanity at times. We are so stir-crazy that we actually asked the doctor if we could drive home Monday night and come back on Sunday for our next clinic visit. This was a weak moment and not a great idea. We committed to being here for a month, so we knew the answer would be no. I do have a propensity for rambling, so let me cut to the chase. Do you think you or your loved ones could stay in a hotel for a month, raise enough money to cover your flight, hotel, and meals, if it meant receiving your transplant within the next few months to a year? Our answer was yes. Krishna and I have been shown time and time again, that our support system wants to help, and have helped in ways we could not imagine. We had to set our pride aside and accept help! People love Krishna, and I bet, they love you too! We can help with fundraising ideas and we are here ready and waiting to help! I am wrapping up I promise. I do want to share one more piece of information. We are set to come home just a few days after Labor Day! I will be making calls to local dialysis clinics at home. We will be asking the social workers if we can conduct seminars regarding our experience. I will post updates on this blog and Facebook as to our progress. We are ready! God Bless You for following this blog, and God Bless everyone that has rallied to help Krishna and I. There are miracles waiting to happen for those who will seek out the information and make a bold decision. This has not been easy, but it has been so worth it. Actually, it has been easy, once we made the decision. I love the saying "Leap and the net shall appear." There was a big net waiting to catch us! I bet there is one for you too! Krishna got the call, we are in Iowa. It has been just six short weeks since Krishna was listed in Iowa! Please share this blog! Krishna and I promised from the very beginning, we would document this journey. Our miracle has happened, we want nothing more than to show others how they can get to better health quicker. Those of you that are following us on Facebook know the story, please excuse the repetition. Those who are new to this blog, it is my hope this story will inspire you! Krishna and I woke up early on Tuesday, August 9th ready to go to see her dialysis nurse at nine in the morning. We had just gotten into the car when the call came. There was a kidney for Krishna in Iowa. We were in shock. We had somewhat of a plan, but the plan went out the window, we were momentarily in a state of shock and panic. The transplant team at Iowa asked the critical question, could we get there? We said YES! without hesitation; however, we were not quite clear as to how we were going to get to Iowa. There was no time to panic, well... maybe a little. There was so much to do, we had to pack, get the girls out of school, call and let everyone know we were headed out, etc. I was running around the house in a frenzy. I was scrambling but not really getting much done. We were ready to go, but we still did not have a way to get there. We had little time to act. We did not want the kidney to be wasted if we could not get there in time. Krishna then made the phone call that put the miracle into action. Krishna called her dear friend and former teacher, Mr. Hearne, who told us a few weeks ago, he would make a few phone calls and would take care of the flight. He learned we were fundraising and assured her he would take care of it. We all thought we had much more time, even though the Iowa transplant team has such a track record for extremely short wait times. Krishna had a few planning discussions with Mr. Hearne previously, but planning goes out the window when "The Call" comes. Mr. Hearne has a few friends who are pilots in our small town. He made a call to his friend Rollie Millspaugh, who would have gladly flown us to Iowa except for he was out of the state on business. Rollie suggested that his friend, Ron Huddleston, use his plane and fly us. Ron agreed to do so, but saw the weather conditions were bad and the smaller plane would not get Krishna there in time. Mr. Millspaugh then made the call to Richard Apsley, the owner of Decatur Mold in our hometown. Mr. Apsley instructed his corporate aircraft, which is pictured above, be used to get us to Iowa. His pilot, Jim Barrow, immediately made the drive from Kentucky to Indiana to pilot the plane along with Ron Huddleston. I still have tears in my eyes as I type this. Our little town has a huge heart! I am not exaggerating or being overly dramatic when I say, we witnessed a miracle that day! There are not words enough to thank all of the men mentioned above for their contribution in restoring my wife to good health. Mr. Hearne did indeed deliver on his promise to take care of the flight. When your dream is big and God is involved, the facts don't count! We flew very comfortably to Iowa and there was a cab waiting on us when the plane rolled into the hangar. The pilots called for a cab and had it waiting. 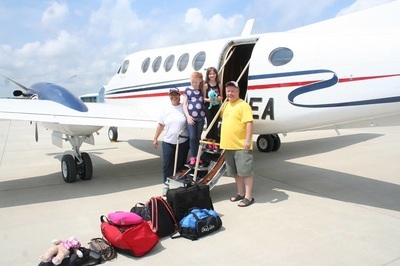 We stepped off the plane, right into the cab, and were whisked away to the hospital. Our girls had never been on a plane, they were in awe of their first plane ride. Krishna and I joked with them and told them not to get used to this kind of treatment. Amazing is all I can say. Krishna checked in and was preparing for the next steps. I could not help myself, I told everyone at the hospital about the plane ride and the miracle that had just happened. The hospital staff was genuinely touched by the story. It is not every day that a beautiful plane is donated! The nurses were rushing around the room drawing blood for cross match testing. This test takes about three hours normally, but in our case, it took over 5. There is always a slight chance that the cross match can come back positive and the transplant is halted. I prayed like there was no tomorrow. Surely, we would not have received this miracle call and even more miraculous flight, only to be sent home without a transplant. The longer we waited, the more worried I was becoming. I kept telling myself, this surgery is going to happen! Surgery was supposed to start at 7. It was almost 10 in the evening when we received the news that the transplant was happening! Krishna was off to surgery, our girls could not hold out any longer, they were fast asleep on the couch. The surgery went well. Krishna has a new kidney. It is at this point that we want to fully acknowledge the loss another family is enduring as a result of Krishna receiving her transplant. We are eternally grateful for the donor, and hope one day, we can properly thank the family. God Bless Organ Donors! I was not an organ donor until my wife needed a kidney. I have been an organ donor for about 15 years now! Wow, we have covered quite a bit. Wait.... There's More! The outpouring of support has not stopped since we have settled here in Iowa. We have received several calls, texts, cards, and donations. Our friends, family, church family, and our community have rallied around the miracle flight and the transplant. We give God all of the glory! He has called many to come to our rescue and we are truly thankful and humbled by the outpouring of support we have received. Again, we cannot say thanks enough! The flight, donations, fundraising support, etc. are all unique to our family. The reality of you or someone you love, receiving a kidney in much shorter time is not. There is so much incorrect information about how the "Transplant List" works. I had a long discussion with Krishna's surgeon and he encouraged us to continue to guide folks to the correct information. The absolute best tool to research waiting list times is the website I found on that late night I decided to take an active role in my wife's transplant is www.txmultilising.com. This website condenses all of the data on transplants into one easy to use site. PLEASE! share this site with your loved ones! Krishna and I know that we received a miracle! We pray that we can be a resource to others who are searching for their transplant. We have vowed to roll up our sleeves and make a difference. We have witnessed three transplants, (One for our daughter, and two for Krishna). We have gained so much knowledge on so many topics from listing to fundraising and we want to share it. That is all for now. I will post more in the coming days. We have many more days here in Iowa. I hope this story is inspiring to others. With tears in my eyes as I watch my beautiful wife peacefully sleeping, I thank God for the miracle of life and the beautiful display of humanity our community has shown throughout this journey! THANK YOU ALL!!!!!! We got the call a few weeks ago, I am a little late posting this. Krishna is on the list. We are so thankful and praise God for answering our prayer. The countdown has begun, now all we have to do is wait for the call right? NOT SO MUCH!!!! We went to Iowa with child like faith and the hope that we could actually do this. We had thought through some of the obstacles which were mostly monetary, but there are also child care issues and other degrees of difficulty. The obstacles did not seem to matter when getting listed in Iowa was just a possibility, they are staring us in the face now that we are listed. The purpose of this blog was to document the journey in real time in an attempt to show others how they could accomplish similar results. We promised to show the pros and the cons in detail, to provide an accurate picture of what is required. Thus far, the good is that we accomplished the listing, the bad is that we are going to have to do some extremely detailed planning, and the ugly is that we still need to raise more money to make this transplant happen. We feel that we have some time, but we are also constantly reminded that the call could come any day. It is gut check time. Can we really do this? The answer is absolutely yes, we cannot turn back now. We have started our second round of fundraising and have about one week left to go. The response has been awesome and we are encouraged and blessed to have such a good support system. It is not easy to ask for financial support, but it is vital. We believe the single biggest obstacle for others will be raising the funds to get their transplant, so we are taking this on and documenting the results to show it is possible. Thanks for reading, and thanks for your support. I will continue to post, for now, we wait and raise funds like crazy. We will do this! Chartering A Path To Good Health, Fundraiser recap. WOW! That's the best way to describe our fundraiser on Saturday. Krishna and I were blown away by the outpouring of support from our friends, community, family, and church family. An absolute certainty of getting a transplant from a center that is far away, is the need for air transportation. When the call comes, there is no time for delay. It does not matter what time of the day or night, we must be ready to go! The target time to get to the hospital is six hours. In our case, it takes about 8 hours to get to Iowa by car. There are no direct flights to Iowa from Indianapolis, so we were advised to get quotes for a charter flight. This is a key reason why we are fundraising. Charter Flights are not cheap. The highest quote was over 16k, and the lowest was a little less than 3k. Oddly enough, insurance may pay for the highest quote, but there are no guarantees. We are leaning toward the lower cost option. This past Saturday we had a vendor and craft event at our local fire station. We had about 12 vendors who paid a small fee to set up a booth at the event. We also sold hot dogs, chips, and water to raise funds. The event was a huge success and we are greatly appreciative. The event was published in our local newspapers. We were amazed at how many friends from the past saw the article and stopped by. Many folks came out to make a donation, buy from the vendors, and grab a bite to eat. We wanted to share this with all of you. It is simply a reality that many folks have to raise funds to make their transplant a reality. This blog highlights the travel expense. There are other expenses such as medications, living arrangements, and possible changes in insurance costs that must also be considered. That is all for now. We want to thank everyone again that has shown us tremendous support! We just returned home from Iowa Methodist Hospital in our quest to list Krishna for her kidney transplant. We stayed in Des Moines, Iowa for two days and drove a combined 16 hours for the chance of dramatically shortening Krishna's wait time. We live in southern Indiana and have access to one of the best transplant centers in the country. In fact, Krishna is listed here at Indiana University Hospital. It would be great to get the call here in Indiana, but we are not waiting for it. We learned through research that Iowa currently has one of the lowest wait times in the country. It was only after we did some research that we learned that we could list with other transplant centers. We learned if we were willing to travel, Krishna could cut 2, 3, or four years off of her wait time in Indiana. Perhaps, you would travel if you had this information. I do believe our training long ago did address multiple listings, but no resources were given as to wait times to my knowledge. I went and found the information and I can show you how to find it as well. The staff at Iowa Methodist was awesome. There is a reason why their program is growing. Their secret has gotten out! Actually, they were not trying to keep it a secret, they are in growth mode. Our experience in Iowa was great. We can see the light at the end of the tunnel, but we also learned this will take some careful planning and it will cost some money. It will cost quite a bit of money. We found ourselves calling charter plane companies during our 8 hour trip down to Iowa and then calling some more on our return trip home. We cannot be listed if we cannot get to Iowa within six hours after we get the call? We quickly confirmed what we expected, charter flights are expensive. We received three quotes. The first quote was $16,000, the second was $7.000, and the third quote was........ Wait for it, wait for it...... $2750. It pays to call around! We also learned that some insurance companies will help pay for the private flight. Oddly enough, the one they may pay for is the most expensive. We may pursue that option, but we feel great that we can raise enough to cover the lowest quote. The flight is just one piece of the puzzle. Where do we live? We will have to stay in Des Moines for at least a month? We have made some calls and have found some good options. We estimate it will cost about $2500 to stay in a hotel for a month. We are looking into short term housing which we feel will be cheaper. What about our children? We called our school system's administration office and explained the situation and we have permission to pull the children out of school at a moment's notice and they will be excused for up to the month that we will be away from home. The school will send the assignments electronically via email. What about work? I am self-employed and we have some income from disability from Krishna and other sources? We are fundraising to offset the travel and living expenses. Our income is enough to pay our bills at home, but we, like many, need help to pull this off. We have experience in fundraising and it is well underway. In fact, we have started a company to help others in the same situation. It is too early to elaborate. We feel we will be able to help many others through our past and current experience. I started thinking about how many people who have a fixed income due to their kidney failure and a good support system could do the same. I think there are many. I believe if they had the information and could raise some funds if needed, they too, would share our hope! IT IS POSSIBLE. WE WANT YOU TO KNOW, IT IS POSSIBLE! Stay tuned, we will know if we are listed in about a week. I will post the results even if the news is not good. There is no guarantee. Until then, we wish you good health and hope you will choose to find your shortest path to good health. My name is Ron Marcoux, that is my beautiful wife Krishna at the top of the page. I have created this blog as we are gearing up for Krishna's second kidney transplant. My goal is to share critical information that we have learned during our 16 years of experience with kidney disease, dialysis, and transplants.